It’s no accident that both members of our reception team are experienced dental professionals — details like this help us deliver clinical excellence with exceptional service. 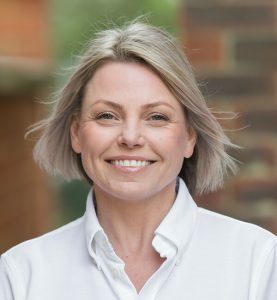 Melanie joined the Portmore team after many years as a dental care professional with experience in general dentistry, implants, sedation and orthodontics. She has a passion for customer service and patient care, and the front of house is the hub of Portmore where Melanie ensures that each patient receives a warm welcome and a big smile. Nothing is too much trouble for her, which explains why she is equally loved by her patients and colleagues. Melanie’s role involves answering the phone and enquiries, meeting and greeting patients and making sure they are happy. She enjoys being part of the mutually supportive team here, and she always feels grateful to see patients leave happier. In her spare time her family keep her busy, but she also loves to go to festivals in the summer, even in the rain, and she enjoys eating out with her husband Trev.